Looking for some help. I need to know the cover and core in the Combat Zone. I have looked around, but can't seem to find anything about it. Who needs a 300 or 800, when I have a 294 and a 295!?!?! the combat zone was abc-approved in january 1997 and featured brunswick's powrxtend reactive coverstock and the medium rg weightblock from the gold rhino pro. The Combat Zone that was widely available to the public had PowrSurge as the coverstock... Differential was listed at 0.047 Slightly higher RG version of the core found in the Danger Zone. Greg - There were a few tour editions for this ball, perhaps that's what you're recalling? If you were both cross-eyed and dyslexic, would you see okay? The basic Combat Zone used the PowrSurge coverstock. The average RG given was 2.5. The pearlized version, was called the Combat Zone Tracer, and used PowrSurge Pearl coverstock. Same core. There was a TE1 version (red pin) of both the solid and the pearl, but they used different core. TE1 pearl: Avg. RG - 3.5, DIff - .023. The solid also had a TE2 (purple pin) which had a core with an average RG of 4.5 and a differential of .023. Both TE1s and the TE2 used the PowrSurge * PowrSurge pearl coverstocks respectively. There was also a TE3 solid (orange pin) which used a urethane cover, had an avg. RG of 6 and a Diff of .018. I suspect that was a pancake core. 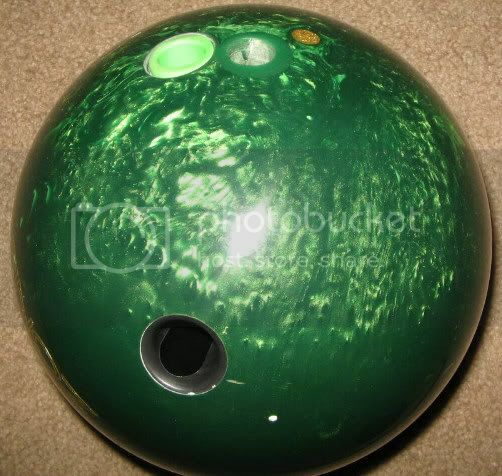 All I have too say is it was one of the greatest balls ever made! I've had three of these. 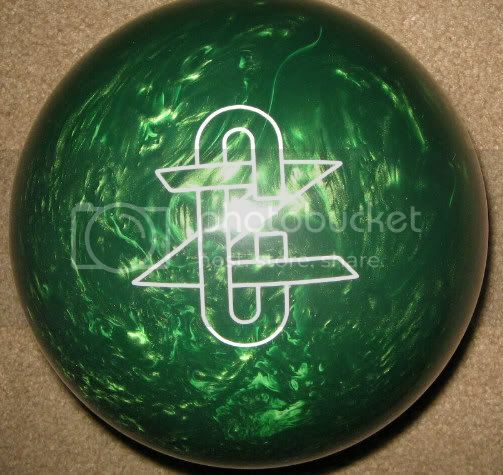 The first one I bought when they first came out and I used it on wood lanes. The ball was great, not too jumpy and handled med oil without a problem (90's medium oil). Today, I have two with two different layouts. On syn surfaces, they are way too jumpy off the dry for me. Yes. it's I, the Inverted One..
Below is my 14# Combat Zone Tracer that is much more ball than I expected on a THS. I've tried to sell it here, but no one seems interested. I guess it would have been more valuable undrilled. Are you looking because someone is trying to sell or trade you one? If so, I suggest you clunk the ball against another and take a listen. The zone balls from this era were notorious for core separation. I've seen Danger Zones, Combat Zones, Black Ices, and Speed Zone Vapors all with separated cores. They were all great balls, but it seemed like it was only a matter of time before they died. Just trying to compare covers and cores from a ball that a customer of ours has. Told him it would be difficult to even come close to match. Thank you to everyone for helping me out. I think I have enough info to give him, but would still love to hear some opinions as to what might even come close to this ball at this point. I own the WRW Jr MVP and the Combat Zone Tracer. I have a video of the MVP in action on a typical house shot. 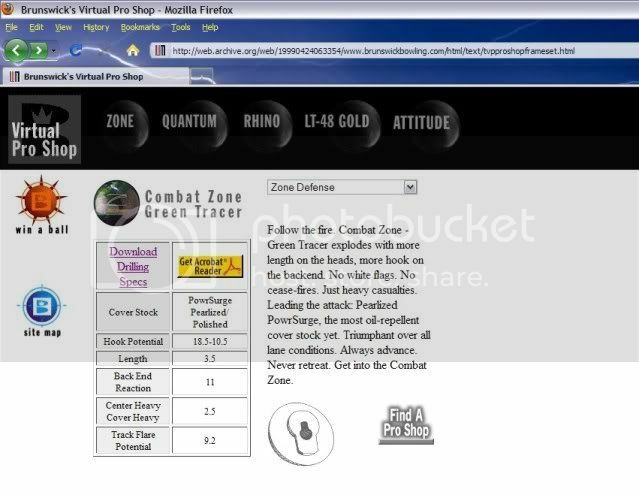 I have not used the solid combat zone but I have used the pearl tracer. The pearl I could venture to say is very similar to the Silver/Blue Avalanche. Something PK18 and Sanded would probably be *close* to the Combat Zone Solid. The grit (1500) will get you the smooth transition from wet to dry the PowrSurge coverstock was known for. If you polish the PK18 you're going to get the yank off the dry that PowrSurge doesnt do. Its hard to duplicate PowrSurge, its just so unique how it burns energy across the lane as you'll see at the lane level on the video.